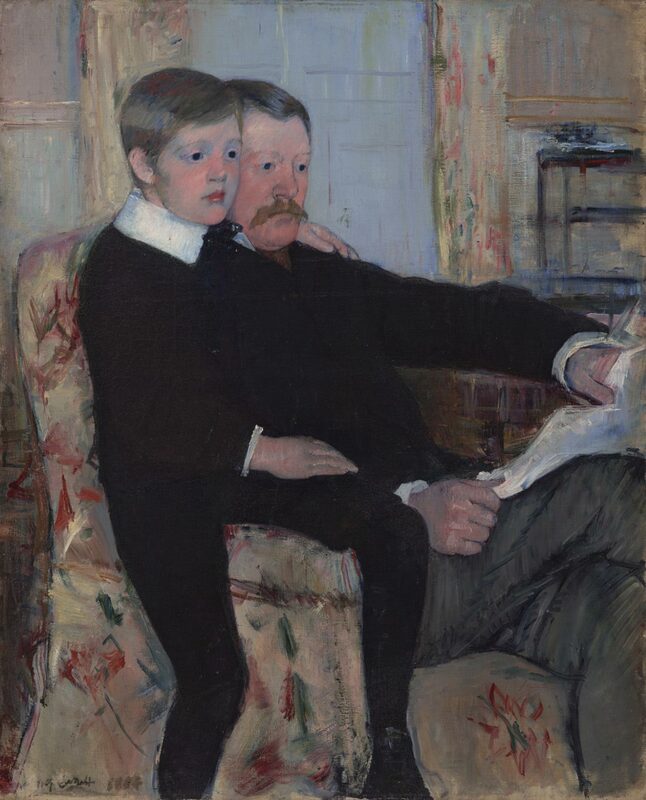 Cassatt's brother and nephew posed for this double portrait during a visit to the artist in Paris. She not only painted several portraits of her brother, a prominent Philadelphia businessman, but also advised his art collecting. As a result, he was one of the first in Philadelphia to own works by the French Impressionists. In December 1884, Alexander Cassatt and his son Robert visited Paris to see Alexander's parents, who were living there with his younger sister, Mary. Born in Pennsylvania, Mary Cassatt spent much of her life in France, where she was a close friend of Edgar Degas and exhibited with the Impressionists four times. Over the Christmas holiday, father and son sat for Cassatt in a double portrait that embodies their strong bond and likeness. Several sittings were completed during the month-long trip. Alexander wrote home to his wife, "I don't mind the posing, as I want to spend several hours a day with Mother any how---and Rob will not have to pose very much or long at a time. "1 The eleven-year-old Robert apparently vexed his aunt and his watching grandmother by refusing to sit still, and his perch on the arm of his father's chair seems to suggest that his presence is momentary. Cassatt completed the painting after the two returned to Philadelphia in January 1885. It is a rare and affecting example of a paternal subject in her oeuvre. Jennifer A. Thompson, from Masterpieces from the Philadelphia Museum of Art: Impressionism and Modern Art (2007), p. 194. 1) Suzanne G. Lindsay, Mary Cassatt and Philadelphia (Philadelphia: Philadelphia Museum of Art, 1985), cat. no. 16, p. 59.